Amy Nuttall on the second series of Downton Abbey. The eight-part series, to be screened later this year, continues to chart the lives and loves of the Crawley family and their retinue of servants but this time against the backdrop of the First World War. The bloody military conflict will lead to personal tragedy for both masters and servants alike and will mean life in the great house will never be the same again. It will also lead to the arrival of several dashing and eligible young officers who will break hearts and further complicate the tangled love lives of the three Crawley sisters. Elizabeth McGovern who plays Lady Grantham is having her hair style checked by Make-Up and Hair Designer, Nosh Oldham while actress Joanne Froggatt, who plays housemaid Anna, looks on. 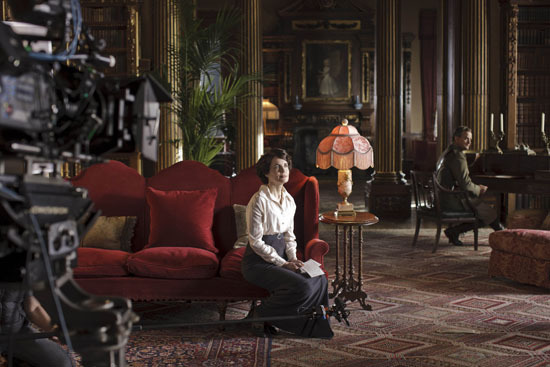 Elizabeth McGovern, who plays Lady Grantham, prepares for a take while Hugh Bonneville who plays her husband, Lord Grantham sits at his writing desk in the great library at Highclere Castle, home to Downton Abbey. The Earl of Grantham, played by Hugh Bonneville, is called up along with many of his male servants from below stairs. New cast member Emmerdale star Amy Nuttall, who plays maid Ethel Parks, told of the excitement of her first days on set at the historic Highclere Castle in Berkshire. Behind the scenes, Elizabeth McGovern, who plays Lady Grantham, was snapped her hair checked before filming on the first day. And Lady Mary (Michelle Dockery, who the series may see finally get her man), makes her her own tea in a disposable cup, it seems. The second series of Downton Abbey will air on ITV this fall. The official US airdate is January 8, 2012, on PBS. I know! I was geeked when I saw the photos. I can’t wait to see the second season!